"This dip is really good with Ritz® chips. I'm requested to make it at all functions and it is always the first appetizer to go!" 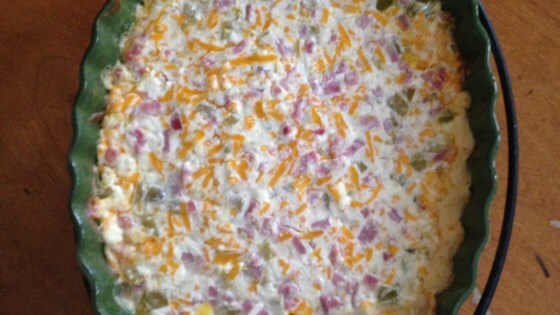 Mix cream cheese, Cheddar cheese, sour cream, ham, and green chilies in a baking dish. Bake in the preheated oven until bubbling, about 30 minutes; serve hot. This was okay but too much cheese. Absolutely delicious! This dip was a huge hit and everyone loved it. Will definitely be my go to for a quick and easy appetizer for any get together. So yummy, quick and easy! It was such a hit that there were no leftovers. Looked just like the photo, but lacked taste. Very bland. I'm afraid I will not be making this again.